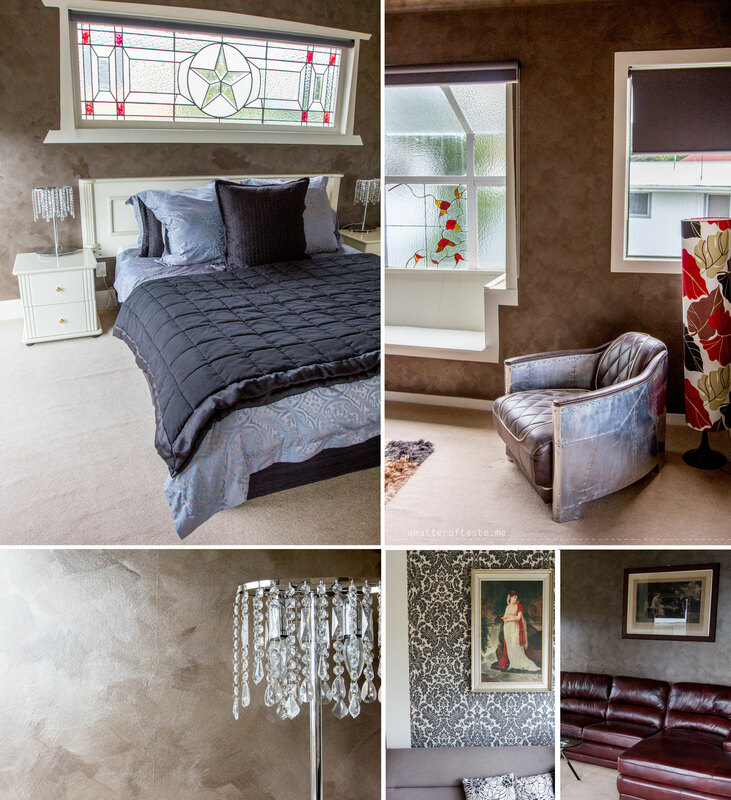 Our pick for two nights in Rotorua was Lake View Penthouse [since then the name has changed to Lakeside City Apartments]. After looking at the photos I felt like it’s going to be a nice, comfy apartment. And it was…mostly. The only let down (only but quite significant) was the bathroom, with small, ugly shower and plastic-like basin. It needs just a little bit of work to match the rest of the place and then it will be great. It may not look like it from the street but it’s stylish, spacious, has many places where you can sit and relax and a big bed with lots of pillows. Unfortunately due to a windy, rainy weather we were unable to use the terrace, but it looked like a great place to enjoy a glass of wine in the afternoon, sitting on a bench-swing and looking at sun setting down over the Rotorua Lake (don’t mind the smell, we got used to it after few hours). Location is also great. Easy to drive in and out of the town and a short walk from eat street where you can find all sorts of restaurants. After a quick research we went to a Moroccan restaurant but, being Monday, it was closed. We ended up in a random Thai place. 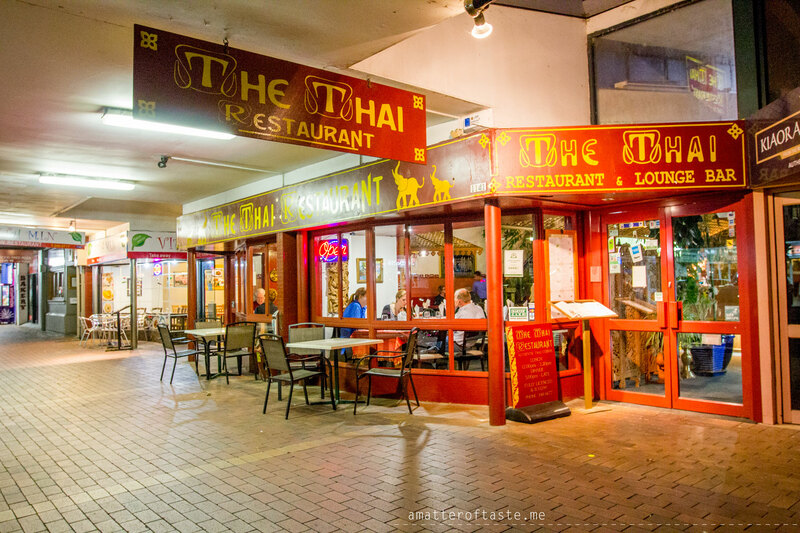 Thai in a small town in New Zealand? That can’t be good… but surprise surprise, it was very tasty. Curry reminded me of the great ones we had in Rawai (Phuket) earlier this year, so it was definitely a good sign. Very enjoyable meal. I had a steak craving and we had a choice of two restaurants serving steaks – we picked the one closest to our apartment. 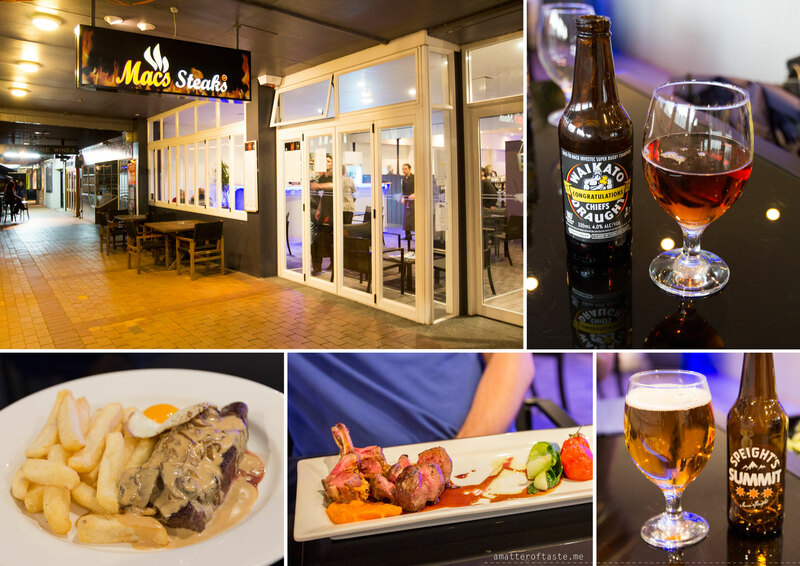 Well prepared meat, staff knowledgeable about local beers and a nice dinner overall. My sauce was a bit disappointing though. My pick was 250g New Zealand prime steer sirloin (served with chunky fries, grilled onions, creamy mushrooms, sunny side up egg), hubby tried the duo of New Zealand lamb (manuka honey & macadamia crusted lamb rack, garlic & rosemary lamb rump, almond butternut puree, veggies, mint jus). 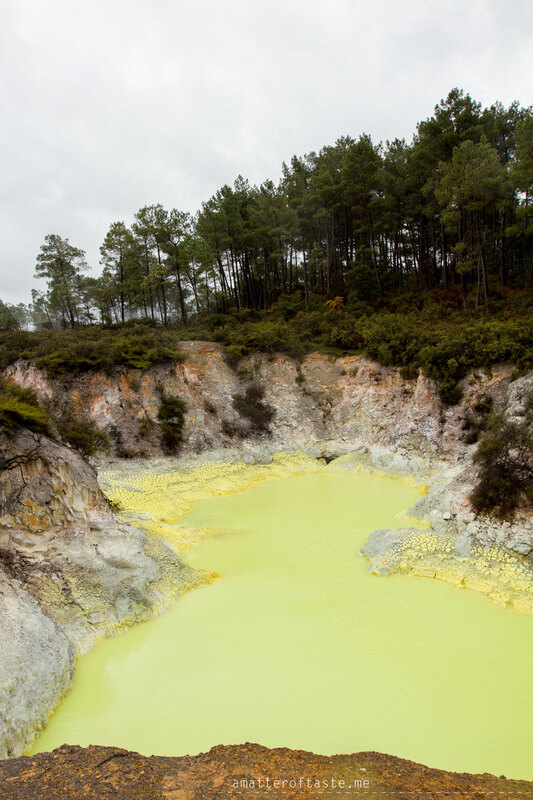 Spectacular geothermal area but unfortunately, we had no luck with the weather – it was rainy and windy, so our visit was very quick. But still, we loved it. 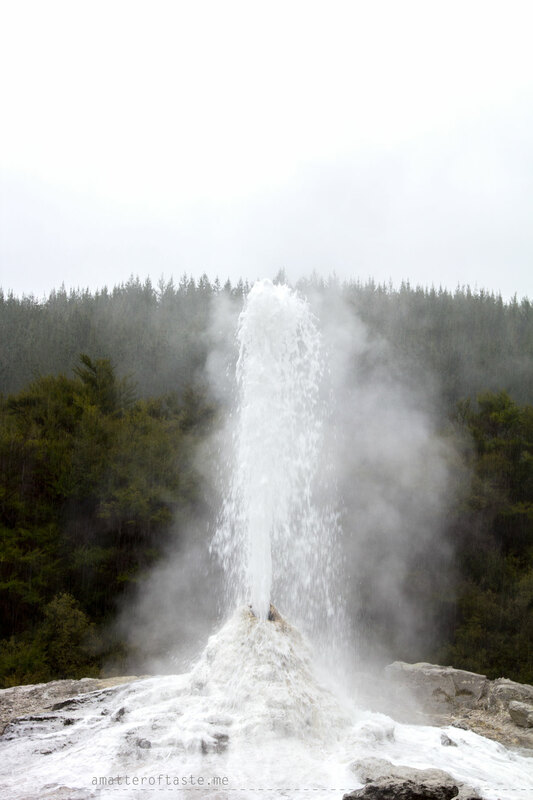 We arrived right on time for the once-a-day Lady Knox Geyser show – it’s triggered with some special substance (soap) and done by a guy who also tells a bit of a history behind the area. After that, we headed back to the main area and went around to see the colourful pools. I really hope I can go back there one day and it will be sunny for a change. 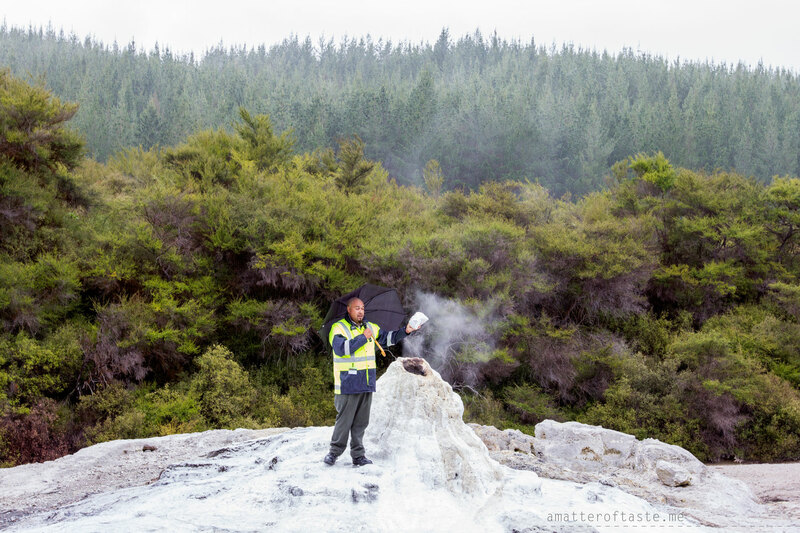 Until then this will be my best (and only) geothermal experience. Price: adult NZD $32.50, cheaper for kids (or free if they’re under 5) and for families (2 + up to 3 kids). 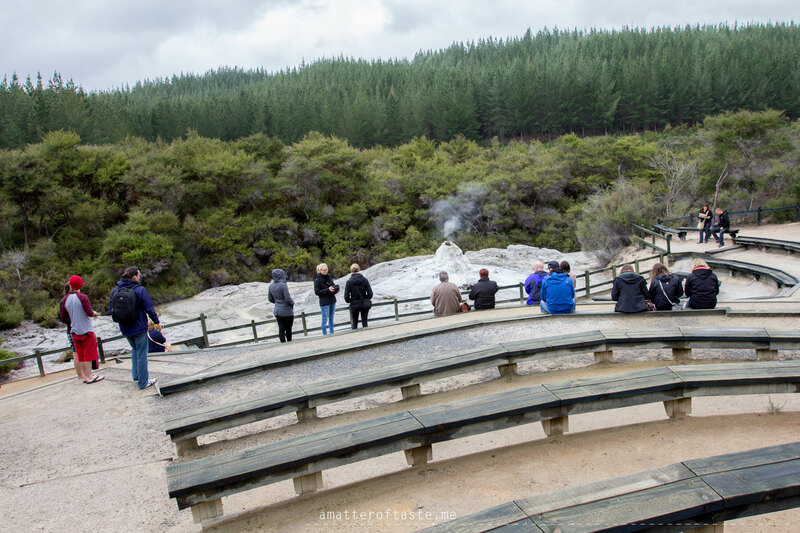 To see the geyser: purchase your ticket at the Visitor Centre (main building) and ask for directions to the geyser – remember it’s only once a day at 10.15am.